Shame, since a Bollywood thread would be fun. Their budgets are getting pretty large as well. Prabhas’ latest is getting a pretty large budget as wel. Not Avengers level, but when you account for the cost differences compared to average earnings? It’d be, very very roughly, like a film costing half a billion. The actual conversion is something like $50 million, but $5k is a normal ‘professional’ salary for a job that would be $50-60k here. Definite a spammer, but @CraigM is right, a Bollywood thread is cool. User banned, but let’s see where the thread goes. I have been thinking this forum needs a thread that covers films currently in the theater that might be worth mentioning, but that really don’t need/deserve a dedicated thread for that mention - sort of similar to the Netflix Recommendation Thread. So I wanted to give it a try. often mentions some Bollywood films. AMC studios does a lot of theatrical releases of Asian Films. Though it has definitely been a not so great year for decent Bollywood stuff coming to N.A. Directed by Meghna Gulzar. With Irrfan Khan, Konkona Sen Sharma, Neeraj Kabi, Sohum Shah. An experienced investigator confronts several conflicting theories about the perpetrators of a violent double homicide. I watched this last night. It’s about a real double murder in 2008 that was apparently a big media sensation in India at the time. After watching the movie, I looked into reviews and articles, and most seem to agree that the movie does a good job of portraying a lot of the complexities of the case and the subsequent investigations. Has anyone else seen it? I really want to discuss it with someone. A story like this is uniquely possibly only in the 3rd world, I think. Just the sloppy incompetence of the Police wouldn’t be possible in most developed countries. But it really makes for a unique story that’s as much about the investigation as it is about the murders. Hopefully Netflix will get it at some point. They’re still good about picking up Bollywood movies, unlike Hollywood movies. They’re still good about picking up Bollywood movies, unlike Hollywood movies. Yeah, which is why I had hope for this. I’ll check the library digital collection, though doubt it. Sorry Rock! Okay, so I’ve never seen a Bollywood film, and have only the most cursory knowledge of the genre. Is there any particular example available on Netflix that you might recommend as a starting point? I used to dislike Bollywood movies during the 80s and 90s, for the most part. The movie I saw that made me reconsider and start giving them another look was Dil Se, so I’m included it as the first entry, even though it might not be the best introduction to Bollywood anymore in 2019. Dil Se (1998): It uses songs not to directly tell the story, but to give it a flavor. And the story is interesting, the cinematography was way better than what I’d seen before, and the audio was fantastic. The main song that takes place on a train was shown by Spike Lee’s student at a course he was teaching in film school, and he loved it so much he opened Inside Job with that song. Dangal (2016): It’s a sports film about a father who, despite his best efforts, only has girls, no boys. But he still wants to pass on his wrestling skills, so he starts teaching his girls. Great characters, and fantastic wrestling sequences. Start with this if you like sports movies. Special 26 (2013): A heist movie! If you’re a fan of heist movies, this is a great one to start on. It’s funny and well acted and beautifully filmed. Highway (2014): I really love this movie. Girl gets kidnapped accidentally. On top of having great acting and cinematography, it’s also a travel movie where you get to see many beautiful parts of India. Kahaani (2012): A pregnant woman goes searching for her missing husband. This is probably not as good a first watch for Bollywood movies as the above movies, but I wanted to include it anyway because I love Vidya Balan, she’s one of the best actresses in Bollywood, and this is a pretty competent mystery that lets her show off her craft. Secret Superstar (2017): Again, maybe not a great first Bollywood film, but a very nice charming movie about domestic abuse that keeps things light for the most part and balances the intense scenes really well with some comedy. Awesome–much appreciated! I’m a sucker for heist films, so I think Special 26 might be what I go with. Well hot dog, I can’t believe this happened. But this movie just showed up on Netflix. (I’m told. I’m not subscribing currently). I’ll see if I can watch this weekend. @Rock8man I’ll finish later, but I’m about halfway through. I had a feeling what was going to happen once the Keystone Cops showed up. So let me preface this by saying that crime drama is really a genre I have limited interest in. Never had the appeal for shows like Law and Order, CSI and their ilk. 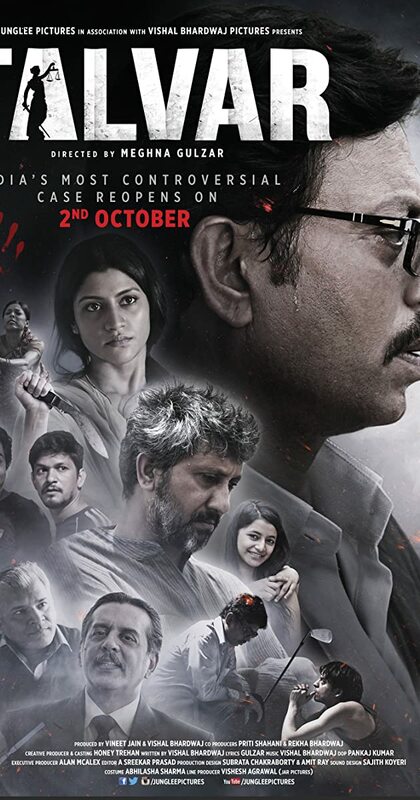 Talvar is a really well made film, and one that has a well made script. And certainly you are correct that the specifics could only occur elsewhere. I would say that the myriad failures don’t feel particularly tied to any one location though. Backwoods Mississippi doesn’t feel immune to the kind of lazy indifference in initial investigations that were the core of the conflict. And the cultural differences certainly threw me off. The whole CBI investigation with the guy with the glasses going off the rails caught me off guard. Maulnly because the things that caused it to fail, were things I had noticed but dismissed as due to cultural differences. Things that wouldn’t fly in the US, but I thought maybe were ok in India. But froma technical perspective it is well made. The composition and editing is high quality. The writing was tight. Even the translation was pretty good. I caught a few things, but it definitely seemed to be mostly changes due to assumptions about (lack) of cultural awareness. Which a good translator should do. After all throwing out ‘you sound like BJP and Congress’ would probably confuse most Americans, for example. So changing it was for the better. It was kinda cool to notice such things though, made me feel ‘in the know’ so to speak. Good pick, and definitely a good example of the best Indian cinema can produce. Yeah, I loved the way they filmed that scene, the one that causes the first investigation to fail. It really made you think, well, this is the way they do things over there. It bothered me from the beginning that the first investigation didn’t really address the locked door that the cleaning lady couldn’t get through. So even though I’m biased like the movie itself toward the first investigation and its explanation, I have to admit, at the very least, the second investigation has a good explanation for that locked/unlocked door. It is a shame that he tortured a confession out of that guy, ruining a potential real witness. Interesting. Looks like there has been a small development after the movie came out in 2015. Yup, I had looked at that. And given the way the movie presents things I can’t say unjustified either. The first CBI crew seemed to have the best case. And definitely seemed to be more likely. But that’s the problem, the initial investigation was so botched by the local police that the truth seems lost forever. That hand print in particular. I watched Anhadhun last night, and was totally charmed. That was wonderful. It’s my first Bollywood film, so I didn’t really know what to expect, but I loved the balance it struck between humor and drama–which is something I often find to be really jarring. And despite its length, it didn’t feel either overstuffed or a slog. And I can’t say enough great things about the score or the cast. If this is in anyway indicative of Indian cinema as a whole, I absolutely need to watch more.